Still leading by double digits. In the race for the newly drawn 17th Congressional District, Rep. Conor Lamb (D-Allegheny) leads Rep. Keith Rothfus (R-Allegheny) by 12 points among likely voters and leading by 10+ points in the Democratic surge model and the low turnout model in a new Monmouth Poll. The poll conducted by telephone from October 5 to 8 of 354 likely voters shows Lamb leading 54 to 42, while 4% are undecided. “The question results in this release have a margin of error of +/- 5.2 percentage points. The error of the difference between the two candidates’ vote share (i.e. the “lead”) is +/-7.3 percentage points,” the article states. This poll shows nearly identical leads for Lamb over Rothfus from the previous Monmouth poll conducted on this race in July. Lamb is holding a 12 point advantage among likely voters in the October poll, while in July’s poll he led Rothfus 53-40. The Democratic surge poll in July had Lamb leading Rothfus by 15 points, 54-39, with the new October poll showing the Democrats lead is 55-41. The low voter turnout model shows Rothfus closing the July poll’s gap by just 2 points. Today’s poll shows Lamb leading Rothfus 54-42 in a low voter turnout model, while Lamb held a 14 point advantage, 54-40, in the July poll. Out of the three models pinning Lamb and Rothfus head to head, all of them are outside the margin of error. It is noteworthy that most of the interviews for the poll were completed before the first televised debate between the candidates aired on Monday night. President Donald Trump won within the newly drawn boundaries by 2 points in 2016, but the likely voters of the district’s disapproval of his job performance is helping Lamb maintain this significant lead, coupled with the Democrats higher approval rating than his GOP opponent. Trump’s job approval rating is just 41% in the district, while 58% disapprove. This is a substantial decline from the President’s numbers in the July Monmouth poll when 45% approved of the President’s job performance and 52% disapproved. The President held a minus-7 net approval rating in July, while the new poll shows the President has a minus-17 net approval rating in the district. The article notes that respondents were asked about Trump’s tweeted endorsement of Rothfus last month, but only 33% were aware of the tweet. The President will be making a trip to the GOP friendly newly drawn 16th District in Erie today in support of Rep. Mike Kelly and other Republican candidates. One somewhat positive development for the Trump agenda in this poll is the difference in how the trade and tariff policies were viewed by likely voters in this district. In the October poll, 42% say the President’s policies on this matter hurt them, while 37% say it helps the economy in their district, with 10% saying it has no impact. In July, when the policies were newly implemented almost half, 49% said it would hurt the district’s economy, with 33% saying it would help and 10% saying it would have no impact. The most important issue for the House race by a significant margin is healthcare, polling at 36% over the 5 other options. On healthcare affordability, Lamb leads Rothfus 45-26, while 19% say they trust both candidates equally. Immigration and job creation are locked at 15 points each for the second most important issue, while gun control was the top concern for 11% of likely voters, and tax policy and abortion rounded out the list at 9% each. Lamb’s approval rating has helped him maintain the double digit lead, but the most significant gains in approval rating the Democrat has made since the previous poll is for those currently represented by Rothfus in the 12th district. In July’s Monmouth poll, 49-46 polled prefered Lamb over Rothfus in the GOP candidate’s district he currently holds office in. Lamb now leads 53-43 over Rothfus in this area when asked which candidate likely voters prefer. The newly drawn 17th district includes slightly over 50% of Rothfus’s 12th District. Lamb’s 18th District only represents approximately 20% of the new district. Lamb leads Rothfus there 55-41, while in July the margin was a bit greater with the Democrat leading 59-36. While incorporating the whole newly drawn district, 52% of likely voters have a favorable view of Lamb, while 20% view him unfavorably and 27% have no opinion. Rothfus has a 37% favorable rating, while 32% view him unfavorably, and 31% expressing no opinion. As the case in many swing districts this election, Lamb’s party affiliation is also working to his benefit. 48% of likely voters would like to see the Democratic Party regain control of the House of Representatives, while 35% prefer to see the Republicans maintain their majority. In July’s poll, the likely voters in this district only prefered Democrats to take control of the House by a 44-40 margin. METHODOLOGY: The Monmouth University Poll was sponsored and conducted by the Monmouth University Polling Institute from October 5 to 8, 2018 with a random sample of 354 likely voters in Pennsylvania’s 17th Congressional District, drawn from a list of registered voters who voted in at least one of the last four general or primary elections or have registered to vote since January 2016. This includes 168 contacted by a live interviewer on a landline telephone and 186 contacted by a live interviewer on a cell phone. Monmouth is responsible for all aspects of the survey design, data weighting and analysis. Final sample is weighted for region, party registration, age, gender, education and race based on state voter registration list and U.S. Census information. Data collection support provided by Braun Research (field) and L2 (voter sample). For results based on this sample, one can say with 95% confidence that the error attributable to sampling has a maximum margin of plus or minus 5.2 percentage points (unadjusted for sample design). Sampling error can be larger for sub-groups (see table below). In addition to sampling error, one should bear in mind that question wording and practical difficulties in conducting surveys can introduce error or bias into the findings of opinion polls. 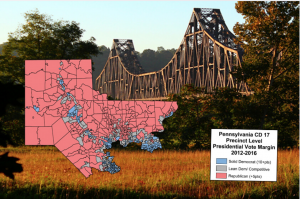 This article was updated to correct the label for Lamb (D-Allegheny). New Jim here. I’ve said this before and will continue to repeat it hopefully it will stick. Rothfus was only elected to Congress because of gerrymandering. He now has to run on his record….one of his first votes was to deny federal aid to businesses and homeowners whose properties were destroyed by Super Storm Sandy……he has voted 12 times to allow insurance companies to deny insurance to those unfortunate enough to have a PRE-EXISTING health condition while repeatedly saying he is a cancer survivor…..he fails to add that he has the Congressional cadillac healthcare plan that allows for PRE-EXISTING conditions. He never mentions that he was a founding member of the House Freedom Caucus aka Tea Party but left it when he figured out it wouldn’t play well in the 17th district……..Not much hypocrisy or lack of empathy for people here folks……I am a voter in the 17th district and everyone and everywhere I go I remind people of his nasty mean votes. No deflection. Love the results of the poll. You and her are both Dumbasses!!! I think you meant “you’re”. Again, “you’re” a dumbass, too!!! your first graf says both candidates are R.